Learn the ins and outs of perfect placement with Volume 2 in the Commercial Learn From the Expert Series. Placement is everything to the appearance and sometimes the functionality of your embroidery. If it doesn't look right, it doesn't matter how many rules you followed. 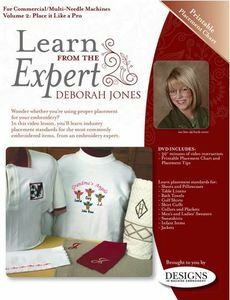 Deborah provides guidelines for embroidery placement, as well as sharing her practical approach to creating embroidery that is straight, in the right location, and facing the proper direction. In this video lesson, you'll learn industry placement standards for the most commonly embroidered items. Deborah demonstrates a wide variety of useful marking and targeting methods. Bonus: 1 sheet of Target Stickers! Embroidery software required to open the embroidery designs. Requires Adobe Reader to view PDF files. This DVD contains both video files and printable reference materials. You will need a DVD-ROM or DVD-R drive to access the printable reference materials.